Pythons have heat-sensing organs which help them locate the prey. 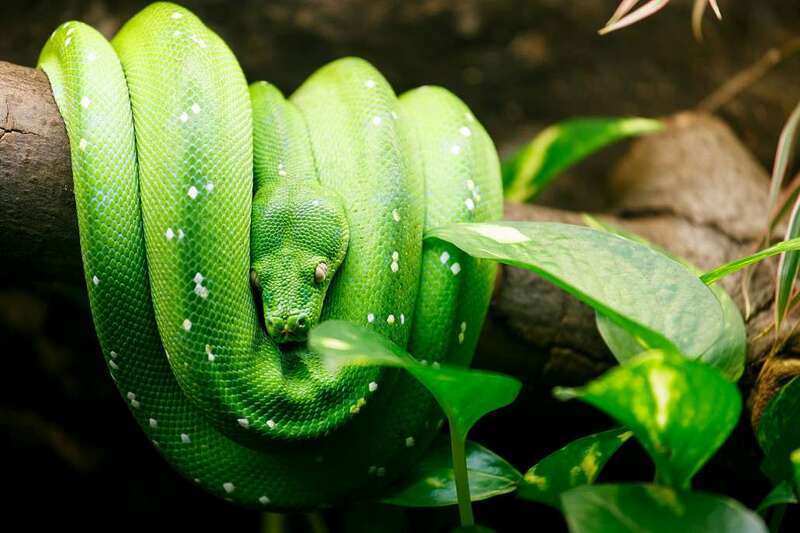 Pythons are cold-blooded animals, but they can increase their body temperature through sunbathing. One of the longest known python species is Reticulated Python which can reach 30 feet in length. Most snakes weigh between 260-300 pounds. Pythons can move 1 mile per hour on the flat ground. In captivity, pythons may live up to 40 years. People kill pythons because of their beautiful skin that is used in fashion industry. Colors of the python’s skin are usually similar to the colors of its habitat. Snakes blend easily with their environment. Pythons attack their prey from the ambush. They are well camouflaged and hidden usually in the trees. Size of the prey determines the time needed for digestion. Bigger prey can keep the snake satiated for weeks or months. Pythons eat 4-5 times per year. Everything except fur and feathers will be digested. Undigested material can be found in the python’s poop. Pythons are constrictors. They kill their prey by squeezing them until they stop breathing.